Affiliate marketing is one of the best ways for beginning Internet marketers to test the water without jumping into the deep end of the pool. The commitment is small, the expenses are minimal or even free, and there is no need to create products. In a real sense, affiliate marketing is just a new twist on an age-old concept: commission selling. In a nutshell, all the affiliate marketer has to do is develop a following of subscribers and then recommend products to them. 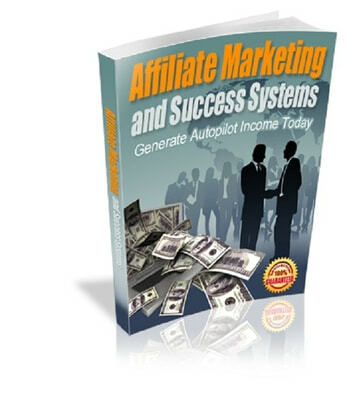 For every ""overnight success"" in affiliate marketing, there are 99% who struggle to make any money at all, and quickly give up in their efforts. In most all cases, it's not a matter of ambition or desire but of practical knowledge about how to succeed in affiliate marketing. That’s why e-books such as “Affiliate Marketing and Success Systems“ are so helpful. You'll learn precisely what steps to take and the procedures to follow to start making real money online. It's not a mystery, and those who succeed are not smarter than the rest of us. It's just a matter of knowing what to do and following the methods with discipline and commitment. Stop wasting your time following yesterday’s methods. 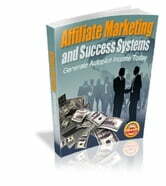 Get your copy of “Affiliate Marketing and Success Systems” and start making money online today!